Tubers have versatile culinary quality and good taste. White Star was first produced commercially in Western Australia (WA) in 2003 following selection from winter-planted selection plots in 2000. Consumer taste tests have indicated that 89% of consumers rated the taste as good to excellent. 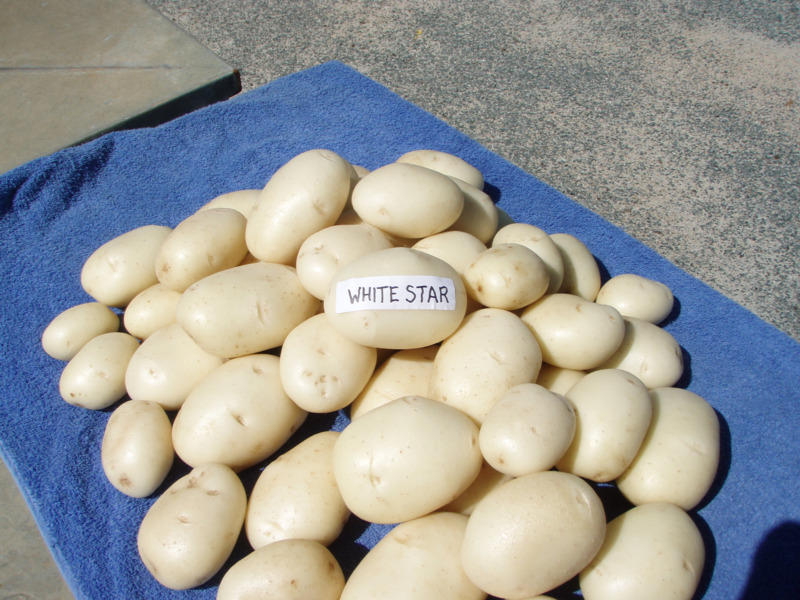 White Star was placed on the Potato Marketing Corporation of Western Australia’s Preferred Variety List in 2005. White Star has cream-coloured skin and flesh. Under Western Australian winter conditions tubers are oblong with shallow eyes and smooth skin. This variety produces larger tubers than Nadine or Delaware. White Star had higher dry matter, as measured by specific gravity, in field tests than Nadine, although White Star showed slightly more sloughing during boiling (Table 1). White Star is a medium height plant with medium to large leaves in winter. In warm conditions leaves can be smaller with some rolling of the margins. Stems are strong and have a red/brown pigment. Flowers are dark mauve to purple. When grown in winter on coastal sands, White Star is a multipurpose, medium dry matter potato. It has a better mash quality than Nadine and is also suitable for boiling, microwaving, roasting and frying. White Star has a light fry colour. White Star is suitable for planting in the Dandaragan-Perth region from March to June, at Myalup from June to July and for early spring plantings at Manjimup and Pemberton. It sets an average of 8 to 10 tubers per plant. Commercial tests indicate yields similar to other varieties but the pack-out was superior. In 2003, 82% of White Star yield and in 2004, 75% of yield was suitable for the Class 1 grade. Fewer small tubers are produced (3% in 2003 and 4% in 2004 of total yield). White Star is not recommended for planting in other regions as during warmer conditions tubers may become distorted with deeper eyes. Production from heavier red soils will result in unacceptable after-cooking darkening. Growers intending to plant White Star should check with their packer for preferred seasonal delivery period. White Star has been taken up by South Australian and Queensland potato growers with seed being supplied from Western Australia. The recommended plant spacing is 25 to 30cm during autumn in the Dandaragan-Perth region. The same spacing is recommended for June and July plantings in the Myalup region. White Star is tolerant to powdery scab. It is susceptible to most other common diseases of potatoes, particularly with poor management practices. Its potato cyst nematode (PCN) resistance is not known. White Star is relatively new and the agronomic information is limited. The same management strategy used for commercial crops of Nadine on coastal sands has been used by growers to produce good crops of White Star. Growers have found that they need to plan a good preventative spray program for target spot (Alternaria blight). More information about winter management of potatoes can be found on other pages listed under See Also. White Star was bred by the Department of Environment and Primary Industries, Victoria. Its parents are Gladiator x 91–158-6. It was selected for winter fresh market production in WA by the Department of Agriculture and Food, Western Australia (DAFWA). Funding to support the development of White Star in WA was provided by DAFWA, Horticulture Australia Limited, AUSVEG and the Potato Producers Committee of the Agricultural Produce Commission of WA. The Potato Marketing Corporation of Western Australia is thanked for the latest production information.